Whether you plan to install a new set of HVAC unit or upgrade your old one to a rental unit, it can prove to be a costly affair if you miss the opportunity to bargain. 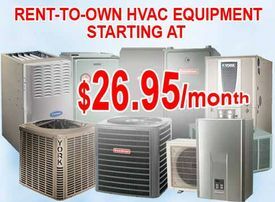 A new heating and cooling equipment can routinely cost anywhere between $5000 to $12000 depending on the size and brand. However, HVAC contractors in Toronto offer furnace rentals and air conditioner installation packages in a combined package. With each passing year, the demand for HVAC rentals in Toronto is witnessing a substantial growth. The best part about dealing with the HVAC contractors in Toronto is their customer-friendly approach. Without giving a second thought, you can still vouch for a negotiated final price…And you may not hear a No for an answer! Here are 5 simple, professional tips on bagging a cool HVAC deal through smart negotiation. For a great bargain on the furnace rental unit you are eyeing for the winter season, try out your networking skills. Friends, family members and even student tenants boarding in apartments close to the University are excellent source of information who can get you good price detail. Pitch the reference to the HVAC contractor Toronto with a price that is undeniably win-win for both parties. Homeowners looking for furnace rentals in Toronto and neighboring suburbs like Mississauga, Milton, Oakville, Brampton and Hamilton have a definite edge when it comes to bagging a discounted price. As a tenant, you can bid for a lesser price by teaming up with the houseowner. For furnace rentals, you can leave out some of the benefits that come in addition to the fixed warranty and zero installation cost saving you $25 to $100 easily. It is like saving on the week’s grocery for some families! If the HVAC contractors does not negotiate on the selling price of the unit, you can try adding useful operations into the package. For instance, monthly assessment and quarterly maintenance. Even if it costs you small amount, add to the package. It will save you hundreds of dollars later on. For every reference you give to the HVAC contractor, you earn business points that serves you well the second time when you plan to rent out a service. While most Loyalty Reward programs come as an overhead cost, try negotiating on them… may be a Free/ discounted card is just around the corner.